What is PDF Compare ? PDF Compare is a Windows-based comparison software that you can rely on to quickly and accurately detect differences between two versions of a PDF file, or identify changes between two PDF documents. Comparing PDF documents is a routine task for people who often share contracts and drafts with others. Missing a small but significant change in a document could mean a huge difference in business. You can compare your PDF files in 6 methods and see the differences instantly with the document comparison tool, unlike other PDF comparer software that features only one or two method. 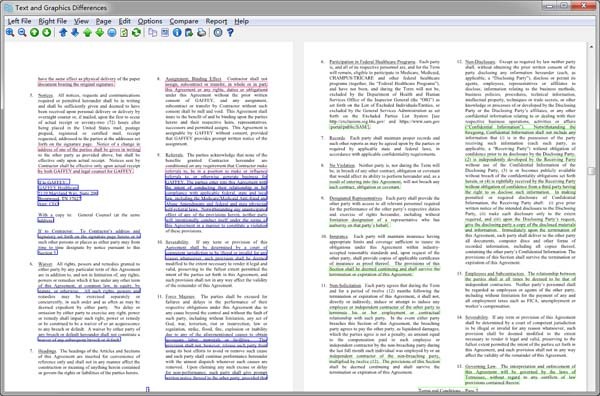 Visual Compare - compare PDF documents pixel by pixel, and highlight differences in different colors. Result can be exported as pictures page by page. Visualize changes. Text and Graphics Compare - Spot all text and image differences, element by element, in the native way, and produces a faster, more accurate result. Result can be saved as pictures, text, or both. It's efficient to compare two versions of a PDF file to see what has been added, deleted, and modified at a glance in an easy-to-read results summary or visualize changes with highlighted bands or rectangles in different colors. Simple Textural Compare - compare PDF files in plain text mode without comparing other elements, such as images, formatting, and layout. Extremely fast. Result can be exported to a report file. Advanced Textural Compare - analyze the textural differences in PDF files including formatting and layout, but without comparing images. Extremely fast. Result can be exported to a report file. Structural Compare - compare the structure of PDF files, such as paragraph, formatting and layout. Result can be exported to a report file. Byte-By-Byte Compare - compare PDF files byte by byte in binary, and identify such differences as author, subject, title, author, producer, keywords, PDF version, creation date, modified date, encryption, total page count, page size, linear view capability. PDF Compare is widely used among accounting, financial services, government departments, legal professionals, scientists, researchers, and technicians globally to review documents and spreadsheets, such as industry regulations, compliance requirements and standards, technical specifications, product hard facts, legal document in PDF (Portable Document Format). What is Business PDF Writer ? How to order Business PDF Writer ?